This move could make high-rolling VIPs nervous all over again. Macau looks like it may still be winning after Beijing implemented new currency controls, but it could shake the foundations of the casino industry once more. Image source: Getty Images. For a minute there, it looked like China had stuck a knife in the Macau rally that had seen the tiny gambling enclave post four straight months of higher gaming revenue. Still recovering from a streak of bad luck that ran for 26 consecutive months, a pronouncement from Beijing that it was limiting how much money people could withdraw from ATMs in Macau sent a shivers down the spines of casino operators, and casino stocks tanked. Although it turned out to be much ado about nothing -- the edict wasn't anything near as draconian as feared -- stocks of casino operators like Las Vegas Sands (NYSE:LVS), Melco Crown Entertainment (NASDAQ:MLCO), and Wynn Resorts (NASDAQ:WYNN) that have a heavy presence in Macau, have yet to recover. LVS price data by YCharts. Late last week, the South China Morning Post published a story saying that Beijing was clamping down on ATM withdrawals. Instead of people being able to withdraw 10,000 patacas (the official currency of Macau) a day, they'd only be able to take out 5,000. It said cardholders had been using the UnionPay bank cards to withdraw the money to get around restrictions imposed at the beginning of the year to limit to 100,000 yuan (about 115,000 patacas) the amount of money they could withdraw annually. The government's concern was the cards were being used to launder illicit money and noted that some 10 billion patacas had been withdrawn through UnionPay ATMS in one month alone. UnionPay is a Chinese financial services firm that is also the only interbank network in China that links the ATMs of all banks throughout the country. The news site also previously reported that Las Vegas Sands' Singapore-based casino Marina Bay Sands was allowing UnionPay cardholders to buy casino chips with their ATM cards, which was said to be a violation of China's strict currency controls. It was Beijing's attempt to restrict the flow of capital out of the country through casinos in Macau that led to the original crackdown in 2013, which precipitated the collapse in its gaming activities. Monthly revenue that had reached a peak of 38 billion patacas in Feb. 2014 plunged to a low of 15.8 billion patacas this past June, and has only managed to creep back up to some 18.8 billion patacas last month. Yet that was the fourth straight month gaming revenue had been higher than the year before. Wynn Resort's new Palace casino opened in August, Sands' Parisian opened in September, and China celebrated its National Day Golden Week holiday in October. That revenues continued rising in November -- surging 14% from Nov. 2015 -- indicated Macau's recovery was well underway, which is why Beijing clamping down once more on capital flight out of the country was so worrying. Even if there wasn't a direct connection with the casinos, it was a bad omen for an industry that counted on VIP gamblers from the mainland spending a lot of money in their resorts. Yet it turns out the news wasn't as bad as suggested. Instead of a 5,000 pataca daily limit as first thought, it was only a per-transaction limitation. That meant people could still withdraw 10,000 patacas in a day, but they'd have to do it in at least two transactions and hardly the apocalypse first imagined. Investors should, however, remain circumspect. As noted, it was the initial attempts at imposing capital controls that led to Macau's downfall. High rollers shunned the spotlight being shone on Macau to avoid the scrutiny of their wealth. While Beijing may not have done much to change the rules with its latest order, it does inform VIPs that the government is still keeping a watchful eye and that may chill gamblers once again. The high rollers who took to other locations to stay out of the limelight may do so again. Macau already faces competitive pressures from resorts in Singapore, Malaysia, and Japan has taken the first steps toward legalizing gambling in the country. While it will be a few years yet before casinos appear in Japan, once built they may prove to be an attractive option too big to pass up. 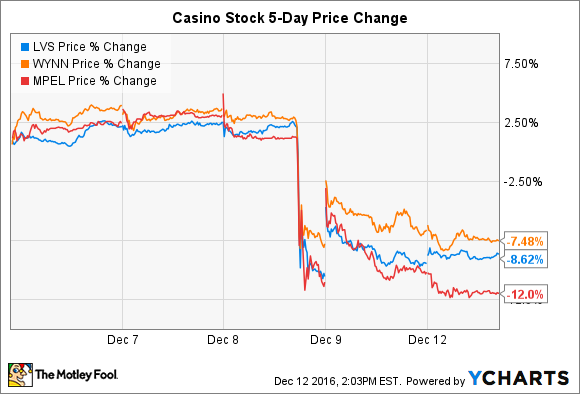 There may not have been any basis for the Macau scare this time, but the reaction by the casino stocks shows just how tenuous the peninsula's recovery is and how fragile the industry has become. The seemingly mild edict by Beijing could just mean casinos will experience a freeze in their recovery going forward.